Last summer we made a forecast that Mr Trump might be America’s next president. Back then, most of the political analysts could not take this as a serious eventuality. They wrongly viewed Mr Trump as an outsider, despised by the USA establishment. And as an outsider they think he has no chance of becoming the next US president. Some 4 months later as CNN headlines read: “CNN/ORC Poll: Trump alone at the top again”1, many political analysts are still in disbelief. Democracy works according to a simple pattern. To make it as a president, a candidate needs access to the mainstream media. In many countries the mainstream media are partly state owned; in the US they are owned by New York based firms like Twenty-First Century Fox (Fox News), Inc, Time Warner Inc (CNN) and National Amusements, Inc. (CBS) financed by Wall Street bankers and Wall Street investor funds. In modern society people do not receive media coverage by accident. It is carefully planned who is and who is not in the media. In the past the media were successfully managed by their owners. Nowadays the editorial staff have more freedom as there is no need for direct censorship. Independent and critical journalism helps to create a trustworthy image of the news station. Al-Jazeera editors are known to have an enormous freedom to discuss every item and point of view they like. This gives the impression the broadcasting station is unbiased, which is also the reason why it attracts a high quality staff. The Qatar based network has only one subject that cannot be touched on critically: Saudi-Arabia. This fosters an illusion all is hunky-dory in the kingdom. The owners of modern media networks exert an influence by allocating budgets. Having the finances to cover every Trump media event, even by critical journalists, is extremely important. 5 articles and 3 pictures of Mr Trump printed on the front-page of Politico every day will increase his popularity, never mind their contents. Strong political contenders like Ron Paul and Donald Trump are well equipped to handle hard questions and criticism from the press corps. It is not the content that counts but the amount of time the media devote to a candidate. The time and amount of money spent on a candidate by the corporate media is decisive for the outcome of the presidential elections. 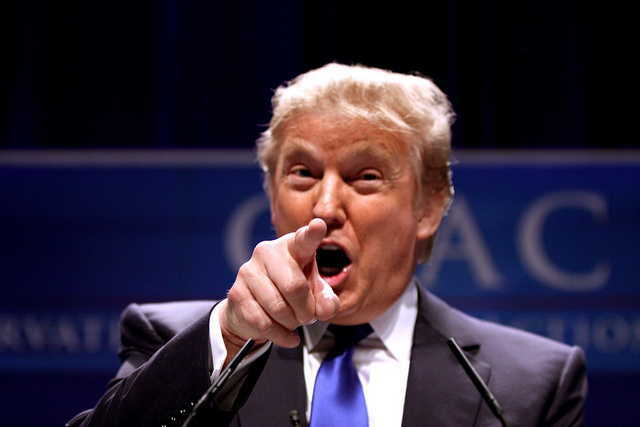 The rallying cry: “Trump for president” is propagated by innumerable media events. A couple of minutes during prime time in the mainstream media is worth millions of dollars spent on advertisement. Ron Paul during the 2012 election was a real outsider, a guy that was not invited to Obama’s or Clinton’s parties like Mr Trump is. While drawing a lot of attention within the GOP and a large base of followers, Mr Paul never got the attention Mr Trump is getting. The paymasters in Wall Street never saw an advantage in Ron Paul as the next president of the USA. The powers behind the scene are not the same as the puppets in Congress and the White House that run the show on a daily basis. There is no political analyst in his right mind who believes Mr Obama or Mr Bush are in charge. Trump’s negative relation with the GOP leadership tells us that American business establishment, those who own the flow of money, are fed up with the current political leadership. Mr Trump’s dislike of the political GOP leadership and established journalists as Megyn Kelly hints at a much more powerful elite behind the scenes. The US powers that be, the people who pay the show, want substantial changes in Washington. Mr Murdoch (Fox and Newscorp) tweeted in July of this year: “Trump popularity based on frustration with DC and endless regulations over people’s lives. Thought this was Rand Paul’s issue”. Mr Murdoch makes it no secret that he endorses the Wall Street billionaire as a presidential candidate. Despite some minor critical tweets from Mr Murdoch Mr Trump is that billionaire candidate! Changes are only possible if the current establishment is eliminated, thus allowing Mr Trump to do the job to get rid of current GOP establishment. Mr Trump’s negative relation with the GOP leadership is a clear sign that those in charge want a clean-up. In history it has often happened that a party purged its own ranks. One of the most dramatic examples is the Night of the Long Knives, during which Hitler eliminated some of the leadership of the SA, his own fellow-men. While it is not expected Mr Trump will literally eliminate his opponents, we think many careers in Washington will come to an end if Mr Trump becomes president. Tendering his resignation, Mr Boehner turned out to be the first victim of Mr Trump. Donald Trump told Breitbart News he is pleased that House Speaker Rep. John Boehner has announced his forthcoming resignation from Congress. “I think the establishment—the Republican establishment—has not gotten the job done,” Trump said. “There are tremendous problems, the establishment has not done it. It’s breaking down. I’m not surprised to see it. A lot of people thought it was going to happen earlier”. Wall Street billionaire Mr Icahn publicly endorsed Mr Trump. Mr Icahn is a Wall Street investor that had many corporate CEO’s resign and replace them with managers that suit Wall Street better. Mr Icahn exercised an unprecedented influence on many company boards and the next step is Congress. According to CNN Mr Icahn created a 150 million super PAC to replace Congress, his top priority is a corporate tax reform2. Mr Trump as president will not extend old policies and taking over the old guards as it was the case with Obama who took over the Secretary of Defense Mr Gates from Mr Bush. We expect Mr Trump will replenish the administration and will make some radical changes in US policy. Now that Trump is gaining momentum we expect that within a couple of weeks many established journalists, and career politicians fearing for their future, will change their attitude towards Trump. We expect that Trump will change his attitude to become more acceptable for the so-called middle field. Mr Trump is currently leading all the polls as the GOP contender, as we predicted it in August. As we already forecast in August: political planners in Brussels, Moscow and Beijing had better be prepared for Mr Trump as the next President of the USA.